Get on target with Kick's High Flyer diagonally ported choke tubes. Every waterfowl, quail, dove, rabbit, and pheasant hunter should have the Kick's High Flyer. The High Flyer chokes feature precision-cut diagonal slots that vent gas, creating an ideal braking system to reduce felt recoil by 25% and increase pattern performance by 20%, and they perform with lead or steel equally well. Designed for steel shot, but equally useful for upland game, the Kick's High Flyer improves patterns and reduces muzzle jump for denser, faster, and more accurate follow-up shots. Installs easily without a wrench but a final tightening with a choke tube wrench is recommended to prevent the choke tube from loosening while shooting. Coated in a Matte black finish. This Kick's choke tube will interchange with 12ga guns with standard Beretta/Benelli threads. For more information about your shotgun interchange please see the firearm owner’s manual or contact the firearm manufacturer. Timber or decoying shots out to 30 yards. Decoying shots out to 40 yards–Works well with large steel goose loads. All around choke that works well from 20 to 50 yards. Pass shooting for open water or open field from 30 to 60 yards. BB and smaller shot size recommended. Timber or decoying shots out to 25 yards. All around mid-range choke from 15 to 35 yards. Pass shooting from 25 to 50 yards. 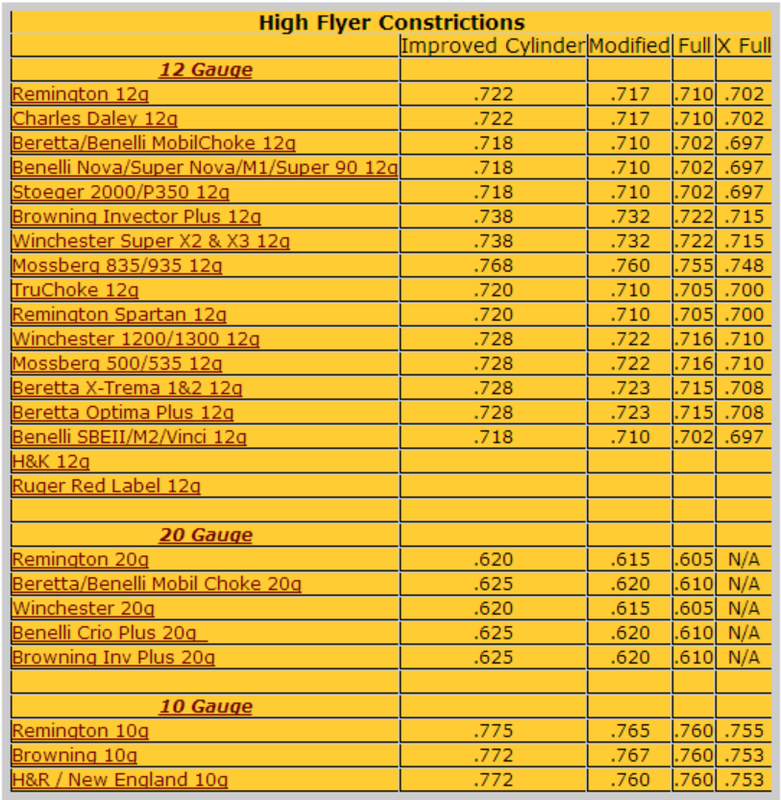 I shoot a 10ga and it is great to see Kicks supply a reasonably priced choke for these big guns. Consistency and reliability are essential when shooting the big 10. This is the second Kicks choke I have purchased for my gun. I look forward to watching the birds come in again this fall. This is the best choke I have ever used for my Browning gold 10ga. I have made multiple kill shots with 1 shot using mod choke and 1 triple that my brother could not beleave when a pack comes in and they line up parallel to each other pass shooting divers. The full gives me a little more range but not the multiple kills on 1 hot. If I hadn't seen you do it you couldn't make me believe you did it! I outfitted my Browning Gold 10 gauge with a Kick's Steel Full Choke. Shooting Hevi Metal 3 1/2 #2's I killed ducks stone dead at 60 yards to 70 yards. My buddy in the blind told me if he hadn't seen me do it I couldn't make him believe I did it. This is my forth Kick's but won't be my last. I bought the full(.717) for my weatherby semi auto. This made a big difference to my success rate. Kills them dead. Does what it's suppose to do. Service, price, and shipping to Canada can't be beat at Cut'em Down Waterfowl. Thanks Guys! Great choke for distant shot! Great price! Great customer service! Much appreciation! After trying other brands that failed to live up to what they claimed they would do. I have finally found kicks high flyer that certainly does what it claims. these are the best chokes i ever used. great product great results well made and at a fair price i own 3 and will be buying more in the future. I have used the "High Flyer" 12 gauge Mod for three years. I have made multiple shots in the fields and in the woods that were precede with comments like:... don't shoot that..... followed by...holy crap you killed that bird!!! I have also shot geese with the mod in my 12, same result. I can dump them regularly at distances I would not try with factory chokes. I like the choke so well I just purchased a Gobblin' Thunder for the upcoming turkey season. I expect the same results. I have outfitted by A5 and my A400 Extreme with the 12 gauge mod. The prices and service provided by "Cut 'em Down" are the best I have found anywhere.